One of Tuscany's best kept secrets is the beautiful valley sheltering this recently renovated 18th-century farmhouse, a podere retaining all the charm and delight of its past combined with updated comfort. 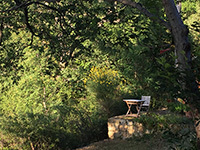 Podere Santa Pia is an authentic holiday home in Castiglioncello Bandini, a small village in the Maremma, in the south of Tuscany, situated half way between Florence and Rome and close to Montalcino, Arcidosso, and Monte Amiata. Situated in a charming position on the top of a smooth hillside, Podere Santa Pia offers an extensive view of a breathtaking panorama all the way to the sea. The beautifully situated terrace has views over what seems like half of southern Tuscany. On clear days, you can have a great view of the islands of Monte Argentario, Elba, and even Corsica. Until 1883, Santa Pia was a small cloister for women.The large stone farmhouse has been lovingly restored, its beautiful stone walls aged by hundreds of years of sun and rain have been barely touched. The house offers four large bedrooms on the first floor with a total of eleven accommodations (2 rooms with a matrimonial bed, 1 room with 4 single beds, 1 room with 2 single beds) and bathroom with a shower and toilet. On the ground floor, there is a second large bathroom with a bathtub. The living room (55 square meters) features two beautiful arches and leads out onto the terrace. The authentic floors and elegant pointed arches create a warm and quiet atmosphere. The big kitchen provides a huge old stone fireplace and also leads onto the terrace with magnificent holm oaks which provide deep shade. There is also a piano in the living room. Wi.Fi connection inside Santa Pia and on the main terrace. The bedrooms are light, spacious and full of light. The rooms are dominated by tall ceilings of supporting beam and tile construction. The apartment, attached to the house, has a spacious kitchen and living room with mezzanine sleeping area for two persons. 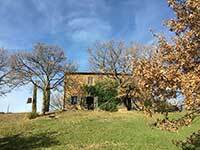 The terrace offers views on the front garden and the rolling hills around Cinigiano. 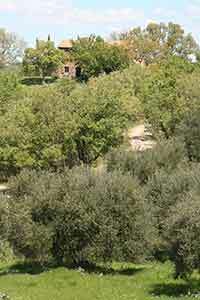 Podere Santa Pia, a formal cloister in the Tuscan Maremma is situated on the outskirts of Castiglioncello Bandini. 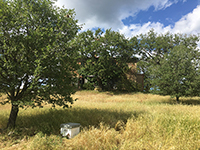 Podere Santa Pia is situated in one of the most unspoiled areas of the Maremma Toscana: nestled between Montalcino and Scansano, Podere Santa Pia is surrounded by the "DOC Montecucco" vineyards, olive groves, woodland and green hills. Silence is broken only by the sounds of nature. 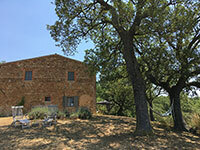 A generous garden sweeps down the hill with fig and olive and downy oak trees offering shade from the heat of the summer sun and offers various areas for relaxing and soaking in the views. The cool shadow of centuries-old oak trees, the thousand colors of the garden changing at each season make this place a natural oasis. 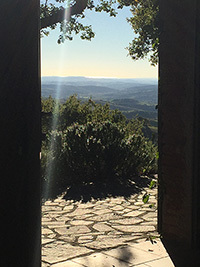 The incredible view encompasses the cultivated hills of ancient castles (Porrona, Colle Massari, Castelnuovo), framed by the wooden ridges of the Amiata Mountain. A vision of the rolling hills of Tuscany, and the irregular horizon line formed by the dense Mediterranean woods, which transport a fresh afternoon sea breeze from the Tirrenian sea, contribute to the farm's idyllic atmosphere. Not too far away, the river Orcia flows into the river Ombrone, which upon surpassing the bottleneck of Sasso, becomes definitively Maremman. There are superb opportunities for trekking and bicycling in a wide variety of landscapes and Podere Santa Pia provides several guides and maps. In High season, the house is only available for rental by the week. We only rent from Saturday to Saturday. In low and mid season, we accept shorter stays and other days of arrival. Reservation is confirmed when 30% advance is paid, the rest of the amount must be paid before arrival. The rooms are provided with fresh bed linen and towels. Final cleaning charges 15 € per person. If you book the house or the apartment fort two weeks in September and October, you'll enjoy a special discount of 50% on the second week. Arcidosso is the nearest larger shopping village (13 km from Casa Santa Pia). Just on the entrance of the village, next to the first roundabout when you come from Castiglioncello Bandini and Monticello Amiata, you have the Coop Supermarket (Via Donatori Del Sangue, 58031 Arcidosso), and Conad Supermarket (CO.RI.M. SRL, via Risorgimento 75). Weekly market day in Cinigiano and Arcidosso is on Tuesday. According to some legends, the beautiful Pia, Nello d'Inghiramo de Pannocchieschi's sorrowful wife, crossed this bridge to go into exile in Maremma, at Castello della Pietra. Dante Alighieri wrote about this legend (Divine Comedy, Purgatorio, Canto V). “remember me, who am La Pia.